Scientists from UC Davis have discovered the faintest galaxy ever. 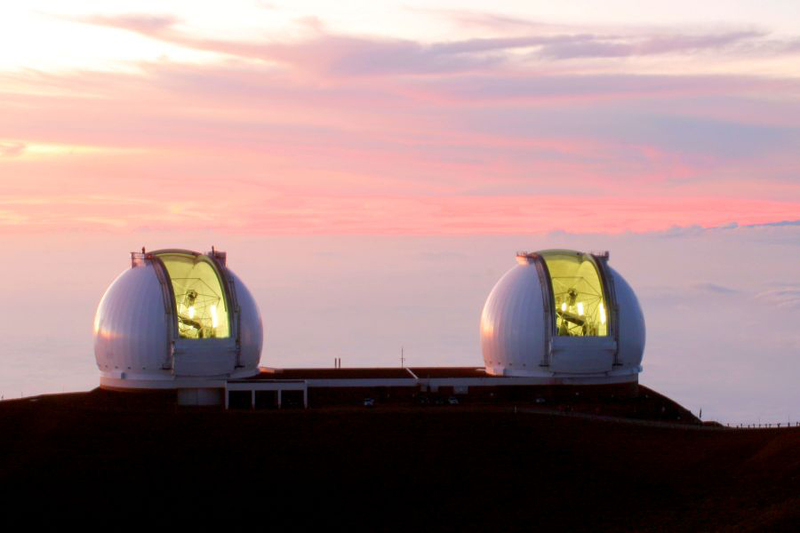 The far away galaxy was detected by using Keck Telescopes at an observatory in Hawaii. The findings could be considered as an extra hint to unveil the mysteries hidden in the universe and its early formation days. Astronomers at the W.M. Keck Observatory report they have found a 13 billion light year away galaxy, containing low stellar mass – just 1% of the Milky Way Galaxy – a fact that results exciting about this finding and makes the galaxy unique, according to Marc Kassis, an astronomer of the Hawaiian observatory. The galaxy was detected throughout a picture captured by the Hubble Space Telescope. The galaxy has not ever seen by human eye, even if it is considered to be part of the beginning of the universe’s formation. Located at a greater distance, could unveil the mysteries related to stars’ creation and how their visibility on space occurred, a phenomenon called “reionization epoch”. Kassis, who participated in the research, has stated that the newly found galaxy is really small and is located far away. According to him, the discovery represents a progress for astronomy while looking for answers about the presence of hydrogen gas from early universe formation and its conversion from neutral to ionized over 13 billion years ago. The discovery of this faint object depicts a progress for humans regarding the aspects that have remained, so far, as “unobservable”. Gravitational lensing effect and the ten-meter Hubble Space Telescope make possible the visualization of the faintest galaxy. Gravitational lensing phenomenon counts as one of Albert Einstein’s predictions from his general theory of relativity; which consist of bending light throughout gravity, which allows the visibility of a distant body because of the presence of another object between the target and the viewer. In this case, the galaxy could be seen through the telescope’s lens and the gravity created by the galaxy cluster MACS2129.4-0741, which was located behind the newly discovered galaxy and was big enough to detect three different images of it. After creating the images, astronomers realized they belonged to the same galaxy because of the similar spectra they shared. According to statements of the leader of the paper containing the galaxy’s discovery, Kuang-Han Huang, a UC Davis postdoctoral researcher, it would not have been possible the visibility of the galaxy without the magnification of its lights made by a gravitational lens. Furthermore, Huang said that the discovery shows the role of gravitational lensing while detecting faint galaxies that date from the reionization epoch. Regarding the paper and the place where it took place, researchers have affirmed that formerly undetected galaxies are visible now because of the instruments they employed and the gravitational lensing. Hubble Space Telescope and Keck Observatory group of research discovered the faint galaxy while the 10-meter Keck II telescope was used in order to confirm that the three images belonged to the same object. 13 billion years ago, when the intergalactic medium was predominantly neutral (unobservable) the amount of hydrogen gas existing between galaxies started a process of transition from a neutral state to an ionized one, resulting in the visibility of the stars, galaxies, squares, or other bodies resulting from the combination of any luminous sources. During this period of the early universe, significant galaxies were created, galaxies that humans now are capable of studying and understanding, thanks to gravitational lensing. The Epoch of Reionization (EOR) let humans deeply understand the process of universe’s creation and to link how matter distribution occurred, during these first days, to the structural system of galaxies and clusters. This period and the watershed event remain as big challenges while looking for answers to explain fundamental questions of cosmology and structural evolution.